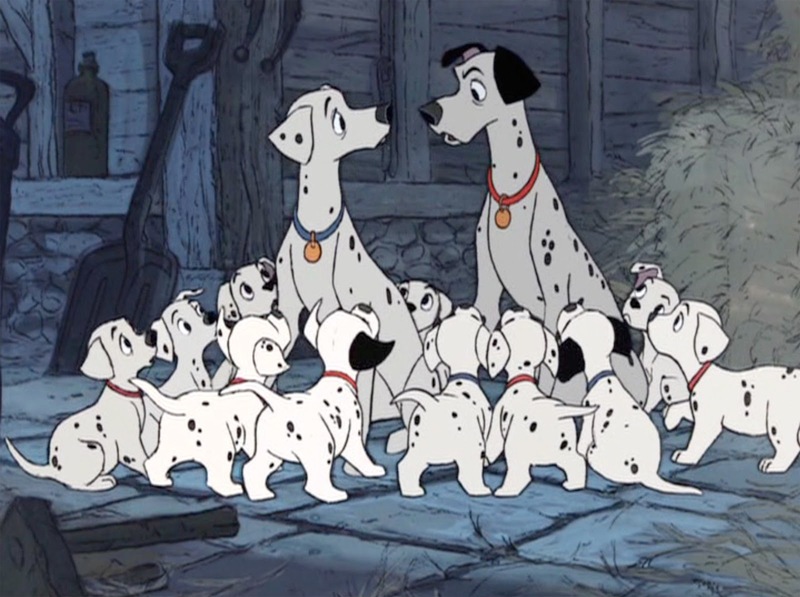 101 Dalmatians is yet another Disney movie that I grew up watching. I especially remember my brother liking it. I had Pocahontas shirts and a kid-sized Little Mermaid table, while my brother was the one who had the 101 Dalmatians sheets and comforter set. We both had dalmatian stuffed animals, though, and we both watched the live action adaptations and the Saturday morning cartoon based on the story. Starting at the beginning, I love the opening credit sequence. Part of it reminds me of the intro of Monsters, Inc., with the jazzy music and the shapes and colors. I also appreciate that the scenes actually correspond to the credits that are being shown at the moment...that's a neat detail. I love the way that Pongo scopes out potential girls and then introduces Roger to Anita. Speaking of Pongo, he's voiced by Rod Taylor, aka that guy that Tippi Hedren stalks in Hitchcock's The Birds. :) And speaking of Roger, I paid special attention to him this time around. Because since I've seen the film last, I stumbled across an article discussing how Roger Radcliffe is one of Disney's best men. It makes a reasonable argument, and I have to admit that he is a pretty awesome guy. :) And while this movie isn't really about romance, here's something interesting to think about...basically all of the Disney romances up until this movie focus on the love-at-first-sight, courtship aspect of romance (though admittedly most of the "courtships" seem to last days at the longest, ha :) and ends with the wedding. 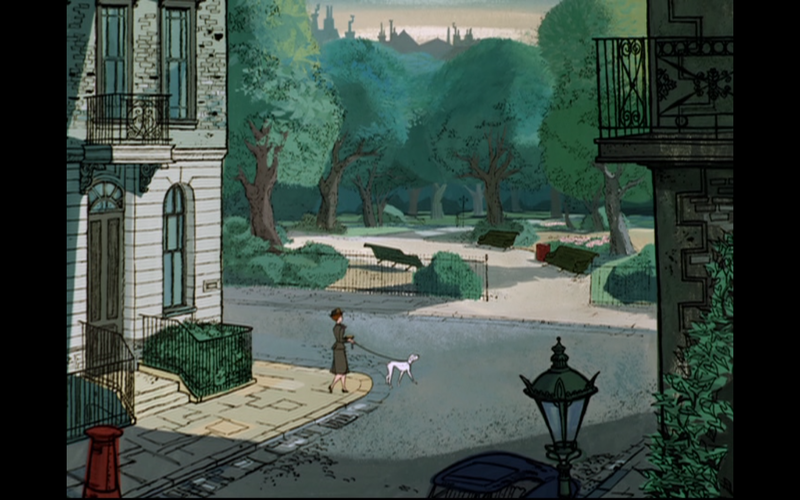 101 Dalmatians shows the introduction, skips to the marriage, and then the rest of the film shows their lives after marriage. I like that. I can't go any further without discussing the most memorable character in this movie: Cruella De Vil. Because this woman is crazy. 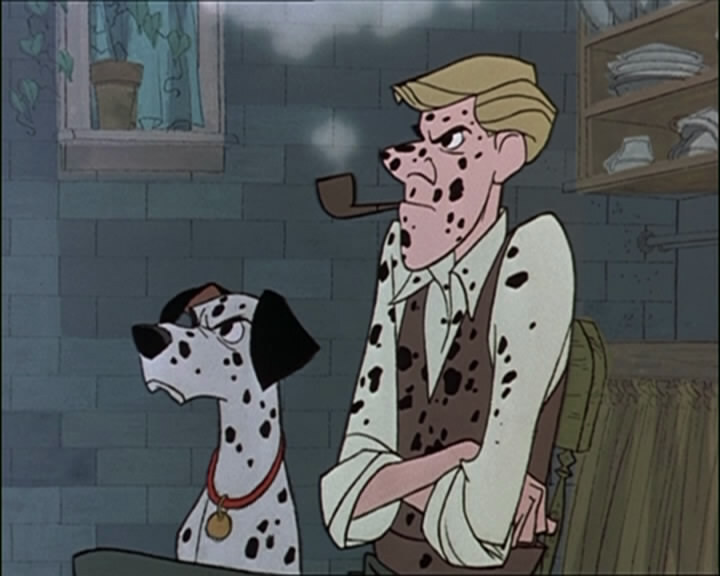 As a kid, 101 Dalmatians stands out as one of the scariest Disney movies that I remember watching, and that's mostly due to Cruella. In some ways, she's even creepier than Maleficent or the evil queen from Snow White. I wonder if that's because this story is set in the real world instead of a fairytale. 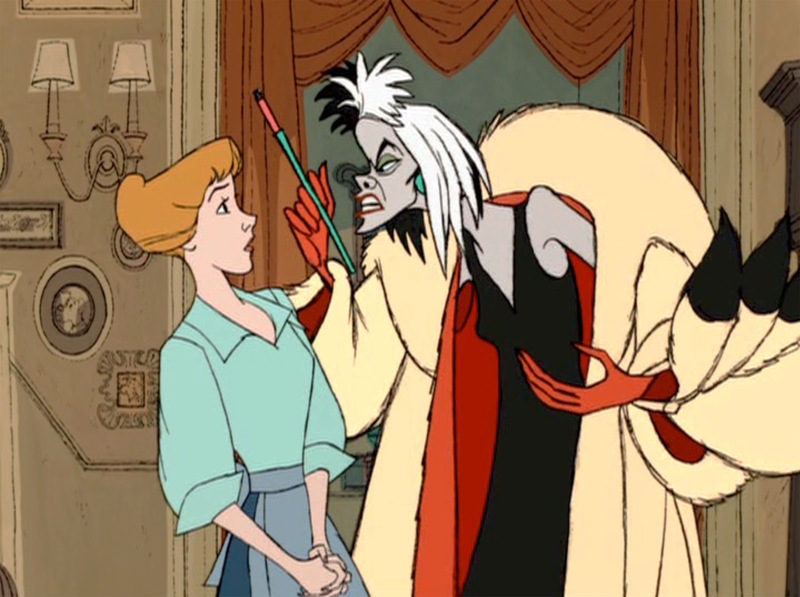 Seriously, though...could Cruella be any creepier? She has bizarre hair, she smokes cigarettes and blows green smoke everywhere, she has a scary laugh, she drives like a lunatic, and most importantly, she wants to skin ninety-nine adorable little puppies to make herself a spotted fur coat. 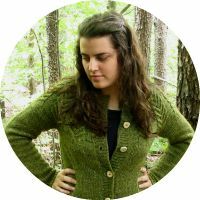 Add to that her two henchman who have menacing names like Jasper and Horace...sure, they're bumbling and incompetent, but they're willing to break into people's houses and kidnap pets and kill puppies. See what I mean? Scary. Now on to happier thoughts. 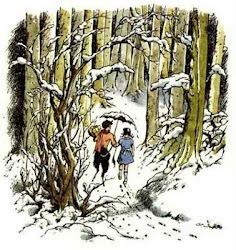 :) Watching this now as a "grown up" (ha) who loves all things British, of course I love the setting. You get London and pretty English countryside, all in one movie. Quaint city apartments, old barns, and a run-down English estate. Since Lady and the Tramp was just two Disney movies ago, and it's also a "dog movie," of course I kept comparing it to this movie. Honestly, I prefer 101 Dalmatians. 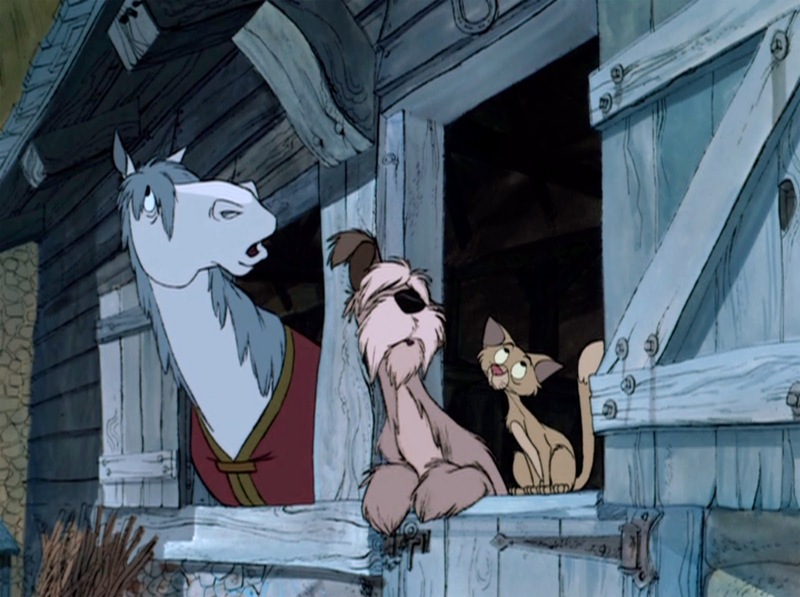 But I kept noticing how some of the dogs from Lady and the Tramp seem to show up in this movie! There's an English bulldog in the pet shop window who looks just like Bull, a Scottish terrier who looks like Jock, and the dog Towser who looks and sounds a bit like Trusty. A few more completely random observations...the lady who owns the pug was knitting in the park! :) Also, Nanny reminds me of a combination of Flora and Fauna, two of the fairies from Sleeping Beauty. Unlike Lady and the Tramp, which only features the two evil Siamese cats, 101 Dalmatians features a good cat! Sergeant Tibbs actually helps rescue the puppies instead of sabotaging things. :) Also, I had never noticed this little reference before...the two henchmen are watching a TV show at the old De Vil mansion called What's My Crime? It's a sort of criminal parody of the classic game show What's My Line? I love that little reference to the era of the early 60s, when this movie was made! 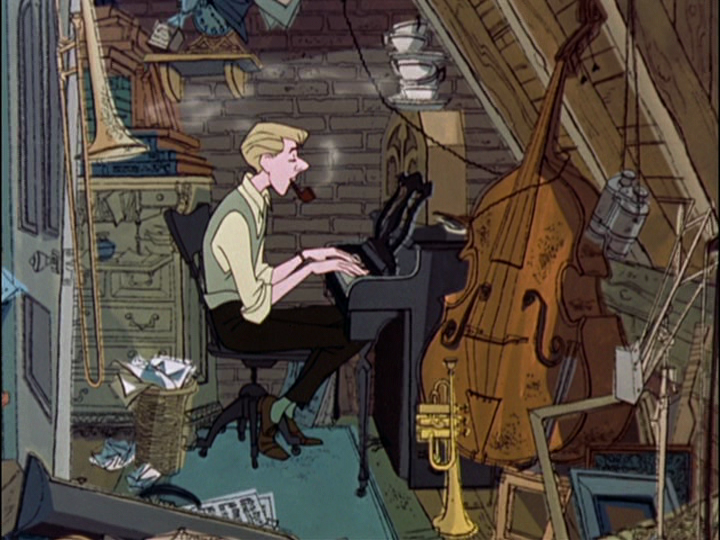 One more thing: 101 Dalmatians is noticeably lacking in songs. It seems to be the first Disney movie that wasn't basically a musical. There are really only two songs in the whole movie, and the only one that you hear all the way through is the Cruella De Vil theme song that Roger wrote. Can you believe it - I have *never* seen this movie! Somehow, we just never owned it and it was never on tv. We did own the live-action version though (hehehe!). I'd love to see this, as it's one of the only Disney classics I've never seen. It sounds really cute and unique! Oh, and I'm looking forward to hear what you think about The Sword in the Stone! I really like that one. I loved this one as a kid, and I continue to adore it as an adult. :) I definitely prefer it over Lady and the Tramp. Though really, if either one happened to be the choice of a child that I was babysitting, I would sit and enjoy without any complaints. :) Cruella De Vil was never at the top of my scariest villains list (possibly because her brand of crazy is so over the top?). I'm not exactly sure why she didn't creep me out on the same level as Ursula or Snow White's stepmother, but I can certainly see why she would be the cause of much trauma! Oh, Ursula...I forgot about her. :) I guess Cruella seems so creepy to me because this story is set in the real world.